Helping you gain RADIO AIRPLAY! According to Billboard Radio Monitor: 86% of Radio Broadcasters in the USA prefer Digital downloads! Access at your fingertips to all the radio stations you need to send your music on the internet via Yangaroo’s DMDS! Over 10,000 radio stations in the US, and 1000’s in Canada and UK, Europe. Your track is delivered instantly into the desktop of the music and program directors, where they can view it and listen to it online. If they like it, they have access to download it instantly into their playlists for rotation, using the latest in broadcast technology. It is simply the best tool, very secure, and much more effective than the traditional route. This is the same software and method now used by most of all the major record labels and independent labels including: Clear Channel, Universal Music, Sony/BMG, EMI, Warner Music Group, Atlantic, Verve, and more! So your music will being going in the same pages as all the major stuff they receive weekly. Just imagine! Cut down on your packages, press kits, paper work, licking envelopes and mailing costs! Now we can reach as many radio stations, music and program directors as you like in just a few clicks. In addition to your music and EPK, we can also send an E NOTE for further promotion! Commerical, Satellite, Live 365, Indie, College, Triple A, DJ Pools, Record Pools and more! 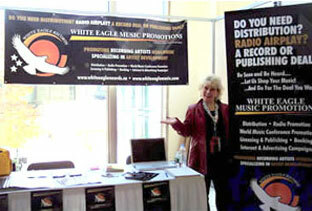 WHITE EAGLE MUSIC PROMOTIONS will send your music digitally, in broadcast quality, along with your, Electronic Press Kit, and pictures, to radio stations via the internet. We will also provide the lists of Radio Stations to you, and the stations who download your songs! Fill out the ORDER FORM online , one for each song. You decide how many tracks you would like to send, and what songs. Send us a physical copy of your CD and Press Kit in the mail. Once we get everything in the mail, we will upload your songs , Electronic Press Kit and information! We will send you lists of radio stations to choose from with music genres, and station formats and go over everything with you on the phone. We start pitching your music for you! WHO CAN WE SEND TO? 2 MONTH MINIMUM CAMPAIGN $3000. Get Radio Airplay, Distribution, Perform, Tour, Press, Media Attention, Sell Records , and Create a Buzz about your act! Then watch the Neilson Sound Reports and Read the Charts in Billboard! Send in a copy of your Cd for listening review, along with any promotion materials you may have. You will be contacted shortly after with our recommendations. What Martketing Materials Do I Need To Send Out to the Radio Stations? Additional Materials that will improve your package! We are not finished our Cd yet. What can you do for us now? WE OFFER MULTIPLE PROMOTION PACKAGES TO SUIT YOUR BUDGET AND HELP YOU SELL RECORDS, GAIN RADIO AIRPLAY, DISTRIBUTION AND BUILD YOUR BUZZ! With several years experience we have the tools, knowledge and connections to help you make your dreams become a reality!